That’s how a lot of us seemed to feel at the screening Wednesday night of Les Misérables in Concert, a one-time only event that celebrated the 25th anniversary of the blockbuster musical. The actual concert at London’s 23,000-seat O2 arena, which took place Oct. 3, featured a huge number of performers — more than 300 actors and musicians, along with appearances by the casts of the two other concurrently running productions of Les Mis in London (one in the West End and one at the Barbican) and members of the cast of the original 1985 production. The stars of the filmed version are mostly hot items in the UK, although they’re pretty much unknowns on this side of the Atlantic. But among the cast also were three people who are notables for various reasons — Eatonville’s own Broadway actor Norm Lewis, who is currently playing Javert in the West End; teen heart-throb Nick Jonas (or is he a former teen heart-throb? I can’t keep up); and maybe the best Jean Valjean I’ve ever seen in many, many viewings of Les Misérables, an English singer named Alfie Boe (above left). In fact, it’s interesting to see this fairly idiosyncratic cast since so many of them are unknowns to us: It’s easier to see them on their merits rather than judge them on their fame. 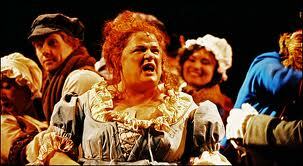 Take the Thénardiers, for example — Matt Lucas, a British comedian and actor, as Monsieur Thénardier and Jenny Galloway (left), a classically trained British actress, as Madame. Lucas, his soft hat shoved down on his ears, looks sort of like M. Thénardier as pig: The ears even look pointy. But he’s inventive, scary and terrific as the comical villain. So is Galloway, her voluminous breasts shoved upward in her dress, her character just as likely to double-cross Thénardier as to back him up. Or take Ramin Karimloo, a thrilling Enjolras, the student leader, who turns out to be an Iranian-turned-Canadian with an extensive history of West End theater — and plays the Phantom in Andrew Lloyd Webber’s troubled Phantom sequel, Love Never Dies. Lea Salonga — the Filipino actress who was the original Kim, the title character, in Miss Saigon — is now pushing 40 (can it be possible?) and makes a grave, gutsy Fantine, much earthier than most I’ve seen. Katie Hall, a veteran of a couple of Lloyd Webber’s British reality shows (I’d Do Anything, Your Country Needs You) is a sweet-voiced but rather chipmunk-faced Cosette (a character whose stage time is cut considerably in this shortened version of the show). But Samantha Barks, another I’d Do Anything veteran, makes a powerful Eponine — maybe as strong as any I’ve seen since the original, the dynamic Frances Ruffelle. 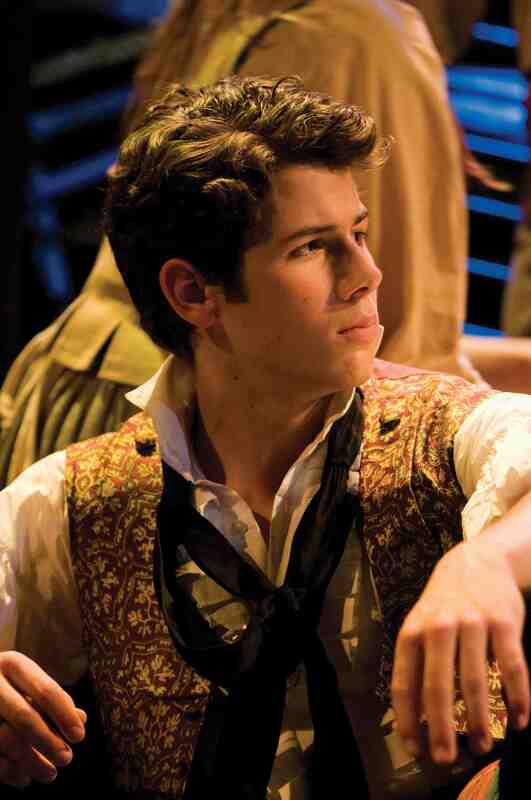 As Marius, Nick Jonas looks just right: He’s baby-faced, just like Hall’s Cosette, and it helps to see the young lovers look as innocent as they do. Jonas — who played the urchin Gavroche in Les Mis on Broadway when he was an unknown 11-year-old — doesn’t have anything approaching a musical-theater voice. 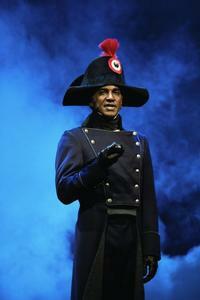 But he’s actually a very good Marius, idealistic and intense; what seems like showboat casting works just fine. Lewis, who graduated from Edgewater High School and studied at Seminole Community College before making a name for himself on Broadway, also played Javert in the 2007 revival of Les Mis on Broadway, and he’s the best Javert I’ve seen. Taller than anyone else onstage, he’s both commanding and tormented, and he sounds glorious, as always. (Why doesn’t Broadway find a starring role for him?) When his character takes his final leap, the audience at the O2 let out a roar, and I have to think it was not because Javert had breathed his last (I hope I’m not giving anything away here) but because Lewis is so damn good. And Boe, a youngish, sweet-faced man, is a thrilling Valjean with, again, a glorious voice. His “Bring Him Home” elicited such a long ovation at the O2 that he was forced, ruefully, to break character to acknowledge it. This film version (which is being released on DVD in the UK next week and, I suspect, will be available here before long) is simply an unstaged, pared-down concert, with costumed actors singing into mikes. But the quality of acting and musicianship is so thrilling, and the show itself such a stirring experience for so many of us, that it feels nearly as satisfying as experiencing the full show. 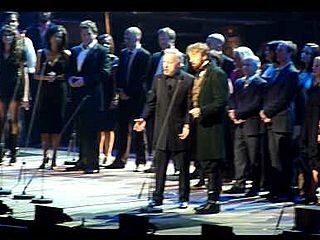 So it’s a bonus to be able to see what happens after the concert ends — when producer Cameron Mackintosh comes out and brings with him the musical’s authors and some of its original stars, including Colm Wilkinson, the first Jean Valjean. Wilkinson, now 66 and white-haired, steps up to the microphone, and when the opening notes of “Bring Him Home” sound again, you could feel the charge in the audience at Altamonte Mall. This was an audience of fans, and Wilkinson didn’t disappoint: He sounds raspier than he did 25 years ago, but somehow still like an angel. When the DVD of this London concert comes out in the U.S., I’ll be among the first in line. This entry was posted in Broadway, Celebrities, Other arts, Reviews, Theater around the world, Uncategorized and tagged Alfie Boe, Jean Valjean, Jenny Galloway, Katie Hall, Lea Salonga, Les Misérables, Matt Lucas, Nick Jonas, norm lewis, Ramin Karimloo, Samantha Barks. Bookmark the permalink. I wholeheartedly agree with everything you’ve stated here, except the bit about Nick Jonas. I thought that Katie Hall and Samantha Barks deserved a better Marius. But aside from that one hiccup the show was intense and amazing, just what a Les Miserables experience should be. 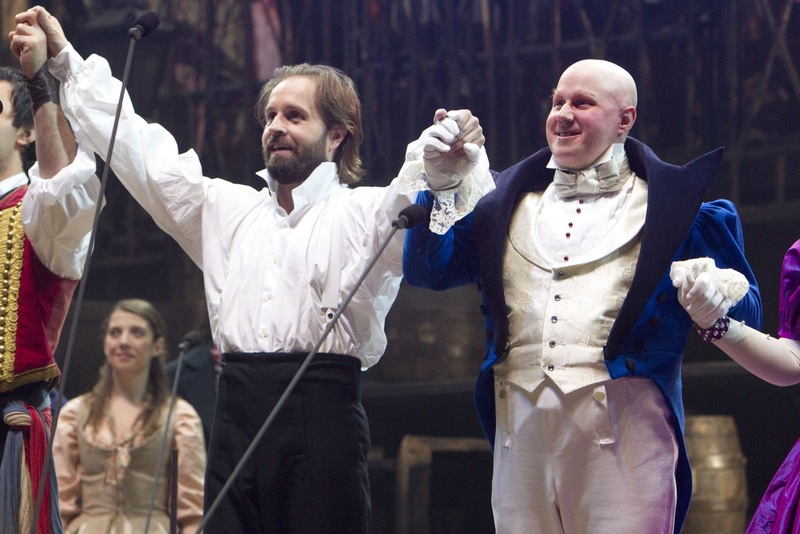 And Alfie Boe is definitely the best Jean Valjean since Colm Wilkinson. Brava! I imagine that if you went in expecting to see Nick Jonas, you were more put off by him than we were (being too old to recognize him and having somehow forgotten that he was involved). I remembered who he was partway through but by then I was used to him.